You can install NetBeans IDE using two methods: either from repository, as you did with Apache, PHP and MySQL, or by downloading the installer from NetBeans web site and running it. The first method is simpler, so we recommend to use it. 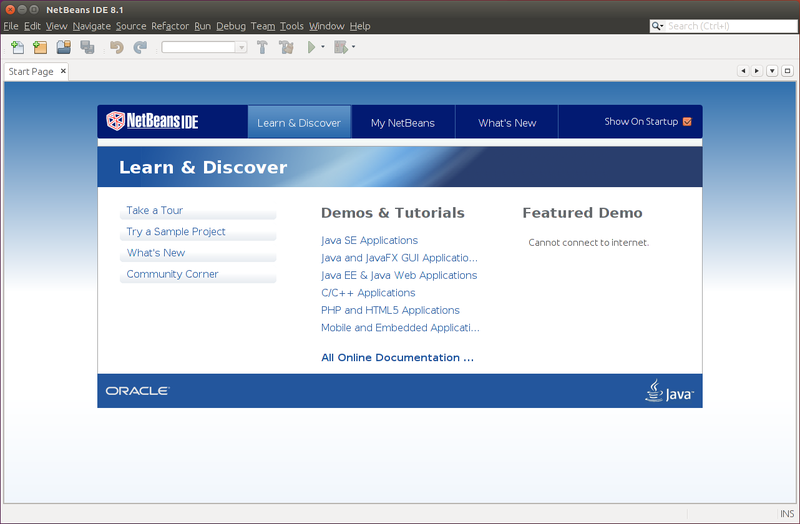 The NetBeans IDE window is shown in figure A.6. To be able to create PHP projects, you need to activate PHP plugin for NetBeans. To do that, open menu Tools->Plugins, the Plugins dialog appears. In the appeared dialog, click Settings tab and set check marks to all Update Centers (see the figure A.7). Then click the Available Plugins tab. On that tab, click the Check for Newest button to build the list of all available plugins. Then in the list, set check mark to PHP plugin and click the Install button (see the figure A.8). It is also recommended to update NetBeans IDE to the latest version by opening menu Help->Check for updates.